Be the first to share your favorite memory, photo or story of Josef. This memorial page is dedicated for family, friends and future generations to celebrate the life of their loved one. 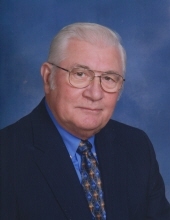 Josef Schneider, age 82, of Burlington, passed away Tuesday, April 2, 2019 at his home. Josef was born in Lazarfeld, Yugoslavia on May 31, 1936 to Nicholas and Anna (nee Sattler) Schneider. He spent his early life in Austria attending trade school where he became a Sausage Maker. He immigrated to the United States in 1956 and settled in Chicago. He was united in marriage to the love of his life, Katherine (Katie) on January 18, 1958 in Chicago, Illinois. Following their marriage, they resided in Chicago before moving to Burlington in 1971. Joe was a resident of Burlington for 48 years. He was the head Sausage Maker at Honey Bear Farm in Powers Lake, Wisconsin and later worked for Usinger’s Sausage in Milwaukee, Wisconsin before retiring in 1995. He enjoyed traveling with Katie, gardening and “putzing” with electronics. More than anything, he enjoyed spending time with his grandchildren and great-grandchildren. He was a loving husband, father, grandfather, brother and friend to many. Josef is survived by his children, Barbara O’Dea, Joseph Schneider and Karen (Mike) Wallace; grandchildren, Shaun O’Dea, Daniel O’Dea, Erin (O’Dea) Warfield, Nicholas Schneider, Lila Acosta, Megan Wallace and Zachary Wallace; and great-grandchildren, Raymond O’Dea, Cora O’Dea, Aubree O’Dea, Katherine Warfield, Santiago Acosta, Rafi Acosta and Kaia Acosta. The family would like to thank the nurses with Aurora at Home and the care givers with Aurora Health Care for their care and concern for Joe. A Celebration of Life will take place at a later date. Per Joe’s wishes, a private committal service will take place at St. Mary Cemetery. To send flowers or a remembrance gift to the family of Josef Schneider, please visit our Tribute Store. "Email Address" would like to share the life celebration of Josef Schneider. Click on the "link" to go to share a favorite memory or leave a condolence message for the family.